You all are so sweet to read my blog, I want to share a Valentine with you. I have been reading about Stumpwork: A Beginner’s guide to Stumpwork by Kay Dennis (http://www.amazon.com/Beginners-Guide-Stumpwork-Kay-Dennis/dp/0855328703/ref=sr_1_3?ie=UTF8&s=books&qid=1266015043&sr=8-3 ) and A-Z of Stumpwork from Country Bumpkin Publications (http://www.countrybumpkin.com.au/product_info.php?cPath=40&products_id=432817) … Both stumpwork books available at Nordic Needle ( http://www.nordicneedle.com/ ) I am also reading Ann Strite-Kurz (http://www.needleartworks.com/dsgnr/ask/askimages.htm) book Stitch Variations and Mutations. I decided to play around with these for Valentines Day and this is one of my results. I made the heart outline on the computer and then stitched it on a 10 inch square canvas, eyeball centering it. I stitched the red and white band down the center using 1 strand DMC #5 Perle Cotton: red (321) and white (blanc) in a Scotch Stitch variation (later will fill some centers with red bead). Then I stitched the left red and white band using the same threads and Scotch stitch in a different variation. I repeated the threads on the right band with still a different Scotch stitch variation with a French knot in the center of four areas. Next I did the cherries using DMC Floss red (321). First I used a red pilot pen and marked the placement on the canvas, I free-handed mine but you can use the dots on the canvas graph as a guide. 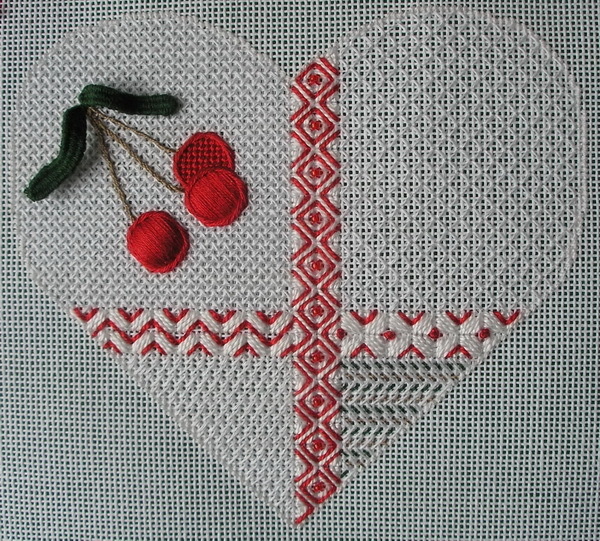 I stitched the cherries in the following order: felt padded, thread padded, and basketweave. Felt Cherry: I attached three layers of felt to the canvas with 1 ply of DMC floss red (321), starting with the smallest and ending with the largest. Over this I placed a layer of stitches going the opposite direction of the last stitches using 6 ply red floss. Then I placed the last layer of stitches over everything. And finally using 3 ply of red (321) floss made the Jessica around the cherry. Remember some Jessica stitches slip under other Jessica stitches. Thread Padded Cherry: Using 6 ply red (321) DMC floss I stitched the padding stitches going the opposite direction of the final stitches. I stitched the padding stitches twice. Over the padding stitches I stitched the final satin stitches using 6 ply red (321) floss, carefully laying the threads. Around this cherry is another complete Jessica using 3 ply red floss. Basketweave Cherry: I used 4 ply (You may need 6 ply depending on you tension.) to basketweave a partial cherry behind the thread padded cherry. I also did a partial Jessica around this cherry using 3 ply red floss. I made the leaves off to the side using a method I found in the Stumpwork books for making wire leaves. I also learned that when you do Stumpwork you incorporate needlelace techniques too. I was too excited to see how the cherries would look, I added the leaves and stems. DO NOT DO THIS…patience is a virtue and it sure makes stitching the background easier if you wait. All the backgrounds are stitched using 1 strand DMC Flouch . Upper Left Background: Stitch the background of the cherry area using 1 strand white (blanc) DMC Flouch. This is a Woven stitch stitches in rows from left to right and right to left. I started I the corner where the red and white bands meet. Upper Right Background: With 1 strand white Flouch I stitched this area with a backstitch starting again in the corner where the red and white band meet. Stitch all the rows in one direction before beginning the rows that are perpendicular to first rows. Lower Left Background: Traditional Nubuko stitched with 1 strand flouch. My long stitch (over 3) meets the red and white bands in the corner. Lower Right Band: Decided I need to repeat the green and brown and so in this small area I stitched a reverse Nubuko using 1 strand white flouch for all the long stitches (over 3). The small over 1 stitches are alternating rows of either 2 ply green (890) DMC Floss or 2 ply brown (840) DMC Floss. I started with a green/white row. Now I would make the leaves…I used two 12 inch pieces of 28 gauge green wire. The center vein is 2 ply green (890) DMC floss wrapped over the 2 wires at the end to make 4ply vein. This 2 ply vein thread should be at least 24 inches long to begin. Do not cut off it will be used later to attach leaves to back of canvas. Over the two wires and the 4 ply vein I wove 3 ply of green floss back and forth from the tip of the leaf to the open ends of the wire. Use a lon-n-ng 3 ply thread and weave snuggly…do not end thread, it will also be used to attach leaves to back of canvas. My leaves are about 1¼ inch long. Before apply the leaves I made the wrapped back stitches stems using 3 ply brown (840) floss. I attached the leaves to the canvas by slipping the wires through the front of the canvas to the back. I also placed the extra 4 ply vein thread and the remaining 3 ply weaving to the back side of the canvas. I secured the wires to the canvas along the stem stitch lines with the 4 and 3 plies of remaining floss. I was going to place this heart in a red tray, but that won’t work stumpwork does not work well under glass. So now my thought is a box, I would love to find a shinny red one or a picture frame. I can picture both so I will wait and maybe next year it will be finished finished. Hope these instructions, picture and graph are clear to you should you decide to try my project. I am going to write up the instructions and use pictures and hope to publish on a website that my DH is going to attempt to build for me soon…I hope. We are expecting more of the white glitter that falls from the sky, BUT I am not going to complain. My best friend’s daughter lives in Alexandria Virginia and she can complain. I talked with her this week and she has 30 plus inches of snow in her yard. She has 2 young sons who no more get outside than they need to come in…”I’m cold…I’m done playing now…I need to get…I gotta go.” Been there, bought that snowsuit. But if you are lucky enough to be able to stitch this week-end you might also want to listen to the Gone Stitching blog. I have no monetary interest in this website but I think it is so interesting and such a great addition to the needlepoint community. I found a couple months back and have downloaded 10 episodes to my I-touch but haven’t figured out how I did it so I still have to download the rest. BUT I have listened to every episode and found them all very entertaining and informative. Go to their new website (http://www.gonestitching.net/index.php/?SID=a4vhk4v2dn9541e1pdhhfro1e1 ) and you will see the blog link. There is also a great contest beginning there too. Check it out!